It is no secret that the Holy Potatoes! game series by Daylight Studios is one of our favorite ones here at Hyper Light Up and we had the chance to review We’re In Space?! when it came out, finding the game to be extremely fun and interesting. We have been looking forward to what the studio will be bringing out next and during Gamescom 2017, we finally got our answer while at the same time had the chance to also meet the devs up close for the first time. We had a chat with Faizan Abid and found out what Daylight Studios is up to lately. Faizan presented to us the third installation of the series, which will be taking place in hell, where the player will act as the Gatekeeper. The game is all about operations management and as Faizan described it, “it is a hell simulation.” You basically get to bake sinner potatoes, so that you can make them into food and present it to the gods. That way, you advance in rank and get to go deeper in hell (but basically at a higher rank yourself). The game of course also gets more complex as you move onwards. 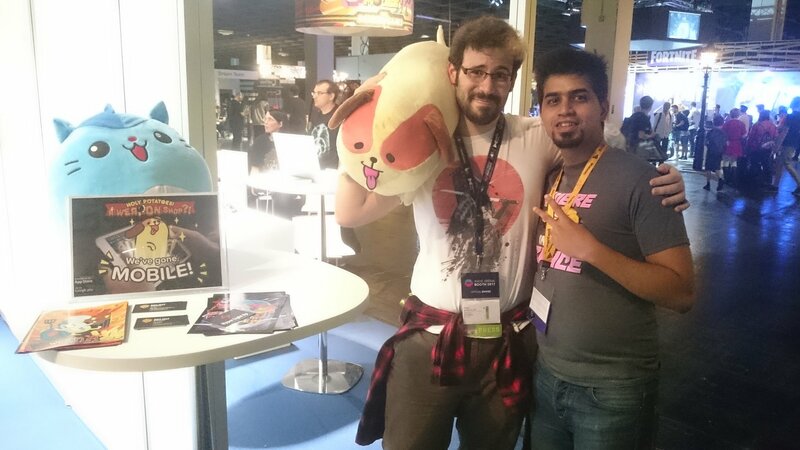 I complimented Faizan on the design of the UI in the last two games and he replied by telling me that “it was quite challenging, having to design the UI as it is one of the important things in a simulation heavy game like ours.” He continued by telling me that the feedback that the studio is receiving while at Gamescom is just incredible since they get to see a lot of things that they wouldn’t have otherwise noticed without so many people practicing their game. More importantly, Faizan told us that, although they are based in Singapore, the studio’s main target group is not Singapore but rather some of the European countries, including Germany. The current plan, is to be able to release in October. It took the studio a year of development for each of their previous two titles and now they are trying to complete the project in just six months, just because they have all the experience and knowledge to speed up the development process considerably. Half a year or not, it is quite admirable to see that a studio can actually pull out so much work in just a year. Faizan did say though, that it is quite a challenging task to have something ready and polished before it actually comes out. The company also recently released their earliest title “Holy Potatoes! A Weapon shop? !” for mobile devices. However, despite the huge projects and the lots of hype that they got, we were told that they are also prototyping a new idea, which will be called “Say What Now? !” Faizan was apparently not allowed to speak too much about the new project, but you should expect some news on that quiet soon. There is also the plan for porting We’re In Space to Switch and although it will take three to five months before it is succesfully ported, the team is quite excited to be working on it. So, for now, we can just expect Holy Potatoes! What the Hell? !, which will be coming out exactly on Friday the 13th of October. You can find the upcoming Holy Potatoes! What the Hell?! game on its Steam page. You can also find Daylight Studios on their Facebook and Twitter. You can also join the Holy Potatoes community by going on their Discord channel.